HydroTops Soil Solo Grow is pH balanced and formulated to allow for maximum assimilation of nutrition required during the vegetative period. With this heightened ability to consume all available nutrition so quickly and effectively, HydroTops Soil Solo Grow helps your plants to produce strong branches, abundant foliage and an increase in flowering sites, setting the stage for a heavy yielding harvest of superior quality. During the vegetative phase, you’re building the foundations and structures required for supporting heavy, large yielding flower sets to come in late flower. Use HydroTops Soil Solo Grow at a rate of 2-5ml per litre from the first true week of the veg cycle week of growth. Begin with a light feeding of 2-3ml per litre, gradually increase to 4-5ml per litre maximum for the length of the veg cycle. In flower, add at a rate of 3ml per litre for the first week of flower, before dropping to 2ml per litre the week after. Decrease to 1ml per litre at the third week of flowering, before ending use. 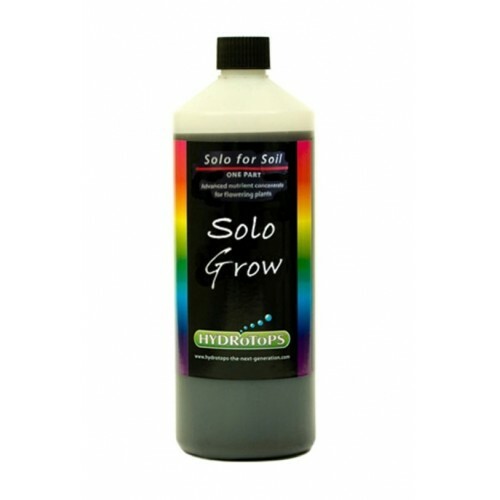 HydroTops Soil Solo BloomHydroTops Soil Solo Bloom is pH balanced and formulated to allow for maximu..
HydroTops Head StartHydroTops Head Start provides the correct ratio of major and trace elements from..